Most model rockets you build will have fins made of balsa wood. Because balsa is so porous and has such a loose grain, you have to give the wood some kind of treatment if you want smooth fins. You have to fill or cover the wood grain with something. Anything you put onto a model rocket while you are building adds some amount of weight. 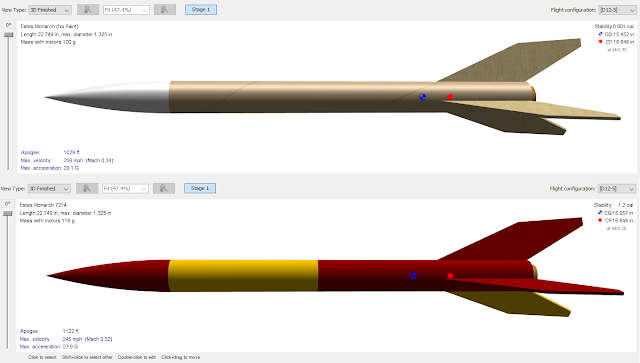 Adding weight changes a rocket's flight - usually lessening the possible altitudes a rocket can achieve on a given motor. I decided to investigate how much weight common balsa grain filling techniques might add to a model rocket build and share it here. I hope any weight-conscious builders might find it useful, or at least, interesting. I decided to do this for a couple reasons. 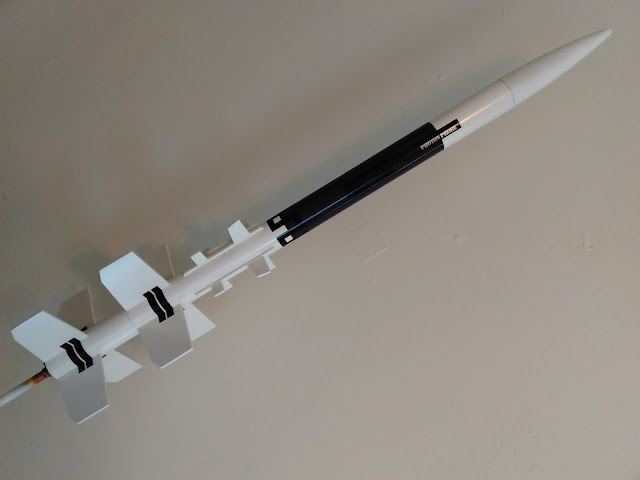 First, a while back here on the blog, I investigated how much weight I was adding to my rockets simply by painting them. The results were surprising, as the rocket I built for that series turned out to be nearly 25% paint, if you counted only the weight. The added mass from the paint would certainly have depressed the altitude this rocket could achieve! Second, I recently built an Estes Photon Probe, and because I had the parts, made a booster for it, so that I'd have a great, two-stage rocket. Lots of people have Photon Probes, but I'd have one that was just a little different! Because the balsa fins provided with the kit were rather soft and warped, I used a technique I don't often use to fill in the balsa grain, and flatten the wood. I papered the fins, by gluing on skins of simple copy paper. Out of curiosity, I weighed one set of the large, main fins before and after papering. By papering the fins, I added 3.3 grams to one set of fins alone. This rocket had four main fins, four booster fins, and 8 tiny "dorsal" fins. The added weight of the paper skins, plus the optional payload section, plus a Jolly Logic Altimeter Two, plus however much the paint job weighed, plus not one but two motors - one in the booster, one in the main body of the rocket - ended up being too much for the motors I had selected, and resulted in one rather disappointing flight. There are many ways rocketeers fill in or cover balsa fin grain. I decided to compare five of the most popular. I'll be talking about fin stock here, but three of these methods - CWF, sanding sealer, and glue slurry - can also be used to fill the grain on balsa nose cones and transition parts. For this test, I selected a nice plank of 3/32 inch thick "Very Hard Balsa" from SIG Manufacturing. The balsa stock was three inches wide, so I cut five square sections three inches long. The result was a 9 square inch (or just over 58 square centimeters) test piece for each method. What I would be attempting to determine is how much weight each filling method adds per square inch (or square centimeter). Results may vary slightly, but should give you a ballpark idea of the kind of weight penalty your rocket may have to pay depending on how you fill in your balsa grain. After a light sanding with 400 grit paper and a sanding block, each piece was carefully weighed on a metric scale accurate to 0.1 gram. I checked the calibration of the scale with a 100 gram weight before each use to ensure accuracy. It was important to weigh each piece before and after treatment, because the density of balsa varies greatly. I wasn't interested in how much my test pieces would end up weighing - I was only interested in measuring how much weight the filler treatment added. Below, you'll see the results of each treatment, and a little pro and con list for each method. I should state that these pros and cons are based on my own experience, and some techniques which I like, others don't, while some others may prefer are not my cup of tea. As always try things out and do what works best for you while building. As long as you're doing things safely and you are happy with the results, don't let other rocketeers tell you you're doing it wrong! This water-based putty is the first thing I ever used to fill in wood grain. It's one of the cheapest methods available. What you are looking for is Elmer's brand, and it comes with the orange lid (you can also find it in a tube now). Any other carpenter's putty or filler is not ideal, as they are rougher in texture. The SIG balsa was really nice and uniform. Nearly every piece weighed in at exactly 2.9 grams before treatment. CWF must be thinned with water, then brushed onto the wood with a paint brush. You allow it to dry thoroughly, then sand it smooth with a sanding block and 400 grit fine sand paper. A really good ratio of CWF to water for thinning is Chris Michielssen's 2.5:1 formula from the Model Rocket Building blog. It thins enough so that the filler is brushable, but not so much it takes forever to dry. Because it is water based, CWF can cause fins to warp, as the cells in the wood absorb moisture. Doing both sides of the fin at the same time should help prevent this. I like to let my fins dry on a cooling rack, seen in the picture at the top of this post. Even though your fins shouldn't warp if you are coating both sides of a fin, it can sometimes still happen. Check them occasionally over the first 20-30 minutes, and if it looks like they're curling, put them between some pieces of waxed paper and press them overnight between some flat, heavy books. After drying overnight, I sanded the piece as smooth as I could. You should leave a very thin skin of filler on the balsa - don't sand all the way down to the wood, or you will expose the grain and have to reapply the filler. It's easiest to use CWF before gluing fins on, because it's easier to sand them smooth if you don't have a rocket body tube in the way. The finished piece looks like this. It may be hard to see with the lighting in the photograph, but the wood grain is faintly visible, yet there is a thin skin of filler left on. If you sand all the filler off in a few places, you will have to retouch the fin and re-sand. The CWF added 1.1 gram of weight. That equals 0.122 gram per square inch, or 0.0189 gram per square centimeter. This is a technique where you may find some variability in results. Sometimes I accidentally sand CWF too far, until some of it is completely sanded away. If the wood filler is sanded off in spots, your balsa grain will show through and you will need a second coat. So, when I use CWF, I sand until I'm convinced it's smooth, and then I stop. In fact, when I first sanded this test piece, it came in at 4.2 grams, an increase of 1.3 grams of total mass - 1.44... grams per square inch or 0.022 gram per square centimeter. I decided to see if I could sand further and still have a smooth surface. So I did, and ended up with the lighter result. Could I have sanded even more off? Perhaps, but I know I'd probably have exposed some wood grain if I pushed it too far. Sanding sealer is a longtime rocketeer's standby. In the old days, this was the standard grain filling material. While there are basic lacquer sanding sealers used in woodworking to get a smooth finish on projects, what rocketeers often use is a type of sealer called butyrate dope or aircraft dope. 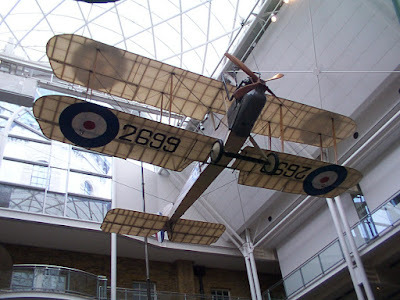 In the early days of aviation, aircraft dope was applied to the canvas skins of airplanes. It would cause the canvas to shrink and tighten against the wooden spars of the aircraft, giving the plane its structure and rigidity. Today, RC aircraft builders still use it to shrink tissue paper skins onto their models. Rocket builders can use it to get a smooth finish on balsa, and because it shrinks, it can tighten the balsa and make it slightly harder. Because of this, though, you need to brush sanding sealer evenly on both sides of the fin, or the shrinking will cause the fin to curl and warp. Sanding sealer actually seals the pores in the wood, so when you sand it smooth, you are able to sand the whole piece to a near glass-smooth texture. Any little imperfections can later be filled in with a good primer before painting the rocket. You brush the sanding sealer on, allow it to dry, then sand it smooth. It usually requires a few coats - between two and five. Rocketeers traditionally apply sanding sealer after fins are glued on, though I usually do it before. You do need to be careful doing that, though, because it will seal the wood, making a glue bond harder to achieve, if you get any on the root edge of the fin. The sanding sealer piece in my test again started out at 2.9 grams before treatment. I used a total of four coats, finally determining I was happy with how smooth the piece was. I did two coats before sanding, then applied a third, then sanded, then a fourth, and sanded again. The finished piece looks almost like the before picture, but you can see it's smoother and a little ashen-white from sanding dust. 3.2 grams. Total weight added, 0.3 grams. This is a gain of 0.03 grams per square inch, or 0.005 grams per square centimeter. Some people use carpenter's sanding sealer - such as Deft or Minwax. It's much cheaper, but you buy it in larger quantities. I've heard it does work, but that it takes more coats and more sanding to get a smooth finish. Since it's not aircraft dope, I do not know if it shrinks. Seals the wood, so if you get it on the root edge of a fin, you may have trouble getting a good glue bond. 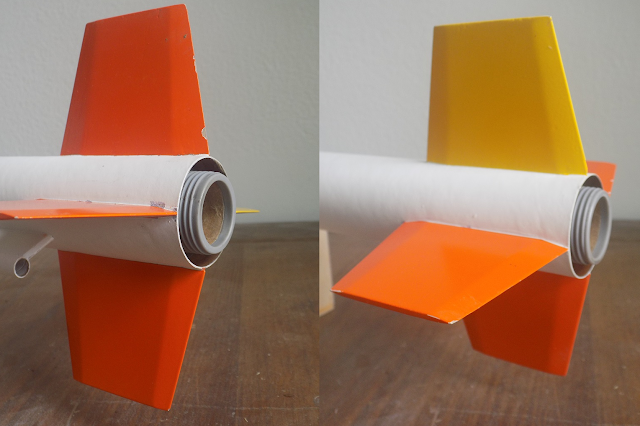 Papering fins is a technique for both concealing balsa grain and adding strength to the fins, by essentially gluing paper directly onto the fin surfaces. This creates a smooth surface (the paper) for painting, and the paper and glue add stiffness and strength to the fin itself. There are four main techniques for fin papering - 1) using glue and paper, 2) using a glue stick and paper, 3) using spray adhesive and paper, and 4) using self-stick Avery labels. I'm going to examine two here techniques here. Probably the oldest technique for papering involves cutting two pieces of paper, slightly larger than the fin itself, from ordinary office printer or copy paper. Glue - either white glue or "yellow" wood glue - is spread on the surface of the fin. Then most of the glue is wiped off with a finger. This leaves only a very thin layer of glue on the fin. The paper is pressed down to one side of the fin and burnished down with any object which can act as a kind of squeegee to squeeze out any excess glue from between the paper and the fin (I use the body of a Sharpie marker). The fin is then flipped over, the process is repeated on the other side of the fin, and the whole thing is left pressed under flat, heavy books until the glue is dry. After that, usually a bead of thin CA - cyanoacrylate or hobby grade super glue - is run along the edge of the paper and fin, sealing the edge down and making any overhanging bit of paper nice and stiff. The overhanging paper is then sanded off and you're left with a really solid, strong piece, which, if done correctly, should not show any balsa grain. If you're having trouble picturing this process, watch this video from Apogee Components. My test piece was, again, 2.9 grams before the treatment. When it was dry, I ran a bead of CA around the entire edge. Normally, you don't apply CA to the root edge, as it may seal the balsa and impede a good glue bond between the fin and the body tube. But I wanted to make sure I got a good clean edge all the way around, and a little extra CA on one edge shouldn't really make a weight difference. The end result looked like this. I expected this to be the heaviest application, but the result surprised even me. This test piece gained 2.1 grams, weighing in at 5 grams after treatment! That's a 72% increase in weight. Put another way, 42% of the weight of this final piece is just the paper and glue! So papering as I did with 20 pound copy paper and Titebond II wood glue resulted in an increase in weight of 0.233 grams per square inch of fin area, or 0.036 grams per square centimeter. While that might not sound like much, you must bear in mind that most rockets have 3-4 fins, and some of them have fins with a lot of area - certainly something to consider when building. The CA can glue your fingers together and cause chemical burns - use with caution! Some builders like papering fins, but prefer using self-adhesive Avery labels (the brand doesn't matter, but Avery seems to be the Kleenex of self-stick office supply labels). It's faster, cleaner, and easier. There's no messy glue to apply, no need to squeegee out excess glue once the paper has been applied, and no drying time. You simply press the label onto the fin, burnish it down, trim the edges, and seal them down with a bead of CA. Once the CA is cured, you sand off the excess from the edges. As you can see from my finished piece, I cheated a little bit here. I didn't have a label large enough to do my test piece with one label, so I had to lay them edge to edge. It would make for a sloppy looking finish, but since I was only testing the weight, it would be good enough. 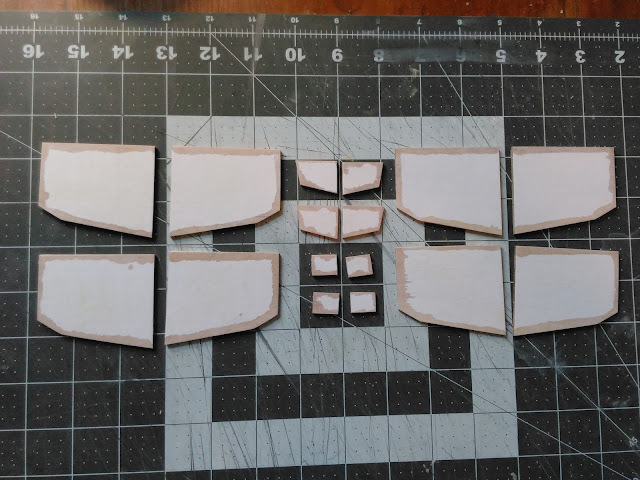 When papering fins, though, make sure you use a piece large enough for the whole fin - two pieces would look just terrible, and could compromise the added strength from the paper skin. My test piece started out at 3.0 grams. Once the paper skins were on, the fin stock weighed 4.3 grams, a gain of 1.3 grams total mass. That's 1.44... per square inch or 0.022 gram per square centimeter. That's only slightly heavier than my final result with the CWF. Using Avery labels is probably the fastest, easiest method of filling balsa grain, but it does have at least one drawback. Because the adhesive on mailing labels isn't wet - as it would be when papering fins with wood glue - it doesn't penetrate the balsa. It just adheres to the surface of the wood, like a piece of tape. As a result, the paper skins can come loose. You may find an edge lifting up after a hard landing. I've found bubbles lifting in the middle of the fin, causing a raised bump in the paint. This one is less commonly used, but I've used it myself, and you do see it recommended by certain rocketeers on the various online rocket building forums. The technique is simple. You take ordinary yellow wood glue, thin it a bit with some water, then re-thicken it with a filler. The commonly used filler in this case is flour. It's possible to use straight up glue, but most rocketeers who use this technique do use water and a thickener. The purpose for thinning and re-thickening is that it makes the glue more sandable. The glue not only fills in and seals any balsa grain, it also hardens the balsa. How much strength you add to the balsa depends on your ratio of glue to filler. More glue makes a harder (but probably heavier) fin, while more filler makes it much easier to sand. Your results may vary slightly, depending on the ratio you use. Still, as we saw in a previous post, wood glue loses about half of its mass as it dries, so this shouldn't add too much weight. When I use a glue slurry on my fins, I don't use flour. It works, but I find that when it mixes with water, the flour hardens into a kind of cement, and it forms such a hard shell I have trouble sanding it. So I'd recommend trying it with another filler - talcum powder. I use talcum-based baby powder for this. Feel free to play around with ratios to find your ideal mix. But if you want a place to start, here's my recipe, which is pretty easy to sand. *If you don't have a digital scale, it will probably work just fine if you go by volume - or just eyeball it. Slurries with more glue and less filler will look more yellow. It will make for a harder - but heavier and harder to sand - balsa fin. Then you can sand them smooth. As you sand, the talcum will be released. It is a little harder to sand this stuff than CWF or sanding sealer, but you should only need one coat, and there's not much chance you'll accidentally sand too much. If you use, say, a 220 grit sandpaper to knock off any large bumps and then smooth the fin with a 400 grit paper, it will take you a long time to accidentally sand all the way through the filler. You will know you are done when the fin is nice and smooth, and you can just see the wood grain through the translucent skin of the glue. It looks a bit the same as the perfectly filled fin with CWF. You'll just see the grain, but you won't be able to feel it. My finished fin weight in at 3.9 grams, having gained 1 gram exactly. That's 0.111... grams per square inch, or 0.017 grams per square centimeter. For evidence of the strength a glue slurry can add to fins, here's a rocket of mine - the Ceres B Booster (design from Make: Rockets: Down-to-Earth Rocket Science by Mike Westerfield). I built this for strength, and finished the fins with a glue slurry. You can see some slight paint scuffing on the fins. That's all the damage they've sustained after multiple flights, a couple of hard landings, and one time being dragged by the parachute through the dirt for about 150 feet - a wild ride which would have badly damaged the fins of most of the other rockets in my fleet. At the very least, the corners of these fins should be gone - yet they remain intact. I don't often use a glue slurry on my fins, but when I do, I never regret it. So you can see, each technique has pros and cons, and each will affect the weight - and therefore, the performance - of your rockets differently. There are other methods you can use as well - thin CA, sanding sealer mixed with talcum, papering fins using a glue stick, etc. These are five common methods that I have tried. I've used each of these techniques on my builds, and they've mostly turned out quite well. My two personal favorites are Elmer's Carpenter's Wood Filler and Brodak sanding sealer. Try different techniques and pick your favorite one! Great article! You really should submit this to the Peak Of Flight newsletter. You could get paid for all your hard work!